After a long night of celebration & grog swilling, Billie just wants to climb into a hammock. But Maria has other ideas. "Clean up all those empty grog bottles while dancing a hornpipe," Maria tells Billie. Explore Billie's grade 3 listed pirate hideout, avoid long drops off ledges & the strange sea creatures imported illegally from the dark waters of the Southeasterly Oceans, & collect those drained bottles of grog. Move & interact with objects with the arrow keys. Go up stairs by standing under stairs & press "Up"
Go down stairs by standing above stairs & press "Down"
Conveyors will only take you in one direction. A Broken Pirate's story on the side. 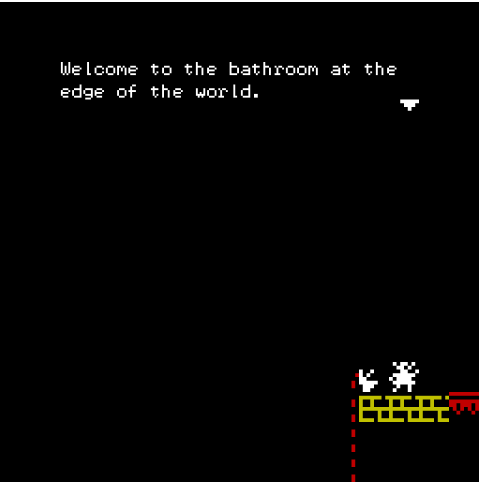 This is also a small nod to Jet Set Willy - I wanted to create something similar in Bitsy. Thanks to Adam Le Doux for creating Bitsy. Thanks to Synth Ruiner for creating Image to Bitsy. Thanks to The British Library for the original end game images on Flickr. As someone who's also attempted to make some sort of 2-D platformer in Bitsy.....wow!!!!!!!! This must've taken so much hard work!!! The puzzles of moving around are great! I love this!!!!! Thanks for the comments everyone. :) The thing to be aware of with the drops is if it's higher than 2 blocks/sprites and you go over the edge it's game over. I like what you did with the stairs! And I love the game, even if I keep dying. Neat! I liked the conveyor belts for a kind of puzzle.